St. Croix Mojo – Our Pick! Haat Medium Spinning – Our Pick! JawJacker Ice Rod – Our Pick! Ice rods are specialized gear, but since they look like cut-down versions of casting rods, it’s easy to get confused about what makes them tick in comparison to their longer cousins. Let’s discuss some key differences. For the spinning and baitcasting rods of summer, length matters. Whether you’re talking about their ability to take the shock of a big fish, enable a sharp hook set, or facilitate a spectacular cast, every inch counts. Usually ranging from six to eight feet, these rods are long for a reason.But when you’re dropping jigs or live bait through a hole in the ice, the long spring action that makes these rods ideal just gets in the way. Crouched over that tiny patch of water, breath steaming in the air of your hut, you don’t have enough space for a seven-foot casting rod.Ice rods tend to be short: roughly 24 inches on the short end to maybe 36 at the maximum. ‘Longer’ ice rods are generally medium action, allowing you to fight big pike and walleye; while shorter rods are usually light to ultralight, making them the weapon of choice for perch, bluegill, crappie, and trout. Rods come in a bewildering variety of powers and actions, and these adjectivestogether describe how they behave under the strain of a fish. The stronger the power, the more weight a rod requires to bend. By contrast, a rod’s action tells you where that weight will start to create a bend, with slower action rods curving closer to the reel.Again, ice fishing’s pretty specialized. The frigid water slows the fish down, making them less active and vigorous. In practice, that means two things for the winter angler. First, fish won’t strike as aggressively, meaning that you’ll need a very sensitive rod to detect those nibbling strikes. Second, they won’t fight as fiercely, and you can catch some real monsters on light tackle. Fishing rods are generally composed of one of three materials: graphite, fiberglass or carbon fiber. This is true for ice rods just as it is for their warm-weather alternatives. You need to know the difference and match them to your lures. Graphite is strong, stiff, and feather-weight. It’s sensitive, too, making it a great choice for cold water angling. Because it’s so rigid, it’s ideal with single-hook lures, as it can really help you snag a tough lip when you’ve only got one chance. Fiberglass is heavier than graphite, and usually less expensive. It’s not quite as sensitive or as stiff, but it can be incredibly strong, earning it a place in your angling arsenal. Most pros leave this rod material for treble hooked lures, as it’s not quite as good for setting a single hook. Carbon fiber is stiffer, lighter, and stronger than the alternatives, providing fantastic backbone and ultrasensitivity, but expect to pay a premium for this wonder material. Handle material is a matter of personal preference and taste. Generally, there are two materials that dominate the market: cork and EVA foam. Cork is light and warm in your hand, but less durable than foam. Foam is light, tough, and soft. Unlike rods designed for casting, these cold-weather specialists have short handles. But don’t let that fool you: handle comfort is critical for ice fishing.When you’re jigging all day, fatigue is an issue. While that may sound like a ridiculous joke, it’s really uncomfortable, and a handle that fits your hand can prevent cramping and allow you to stay on the ice longer. The rings lining the underside of your rod are called guides because they “guide” the line off the spool. Made from a variety of materials, including ceramics like silicon carbide, and metals such as aluminum oxide and stainless steel, guide quality is important.For casting rods, your distance will be affected by the friction the guides create, among other factors. That’s obviously not a problem over the ice. But when the fight is on, guide quality matters. As the fish fights, you’re placing a lot of strain on the line as it rubs the inside of those guides. And low-quality means intense heat, frayed line, and a big one that got away! Test them by ‘sawing’ line against them to see if they abrade really thin line like 2 pound test. Having more guides is generally better since they help distribute line stress and reduce the friction and heat at any one point. Length: 24”Material: carbonPower/action: ultralight/fastHandle: cork/EVA foamGuide material: stainless steelSt. Croix produces first-rate rods for every angler, species, and environment, and their Mojo ice fishing series is no exception. Crafted from ultra-stiff, ultra-strong carbon fiber, you won’t find a more sensitive rod–or one better suited for sluggish bites. But be warned: while not expensive compared to casting rods, this is one of the least budget-friendly options we reviewed.That said, you get a ton for your money. Stiff, sensitive, strong: these words take on new meaning with the Mojo, and you’ll feel even the most hesitant strikes with this rod. It delivers comfort in spades, too, with a combination cork/EVA handle that allows for a wide range of grip styles. That’s a premium feature we really liked, making this rod a stand-out.Three primary stainless steel guides keep your line cool and abrasion-free. 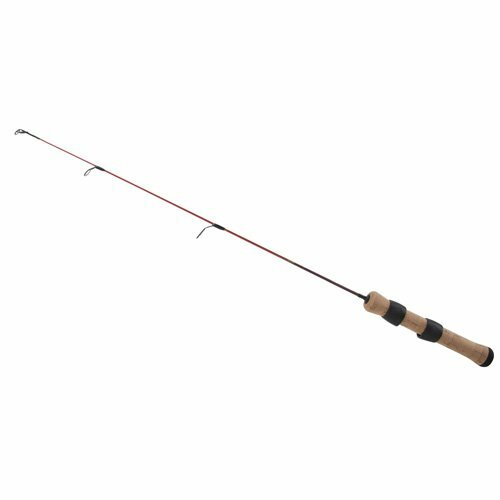 Length: 24”Material: fiberglassPower/action: ultralight/fastHandle: corkGuide material: stainless steelBerkley’s rods are a staple of summer, and their Cherrywood series is well-respected by anglers for its sensitivity and strength. Berkley’s ice fishing version offers the same quality at an incredibly wallet-friendly price, and though we generally prefer graphite, this fiberglass rod delivers.It features the same stainless steel guides as its warm-weather sibling, albeit only two of them plus the tip. It’s more sensitive than its composition would suggest, allowing you to feel even the tiniest nudges under the ice. But that great feel doesn’t mean it lacks backbone. These rods are surprisingly strong, and we’re impressed by their ability to land fish that are outsized for this tiny tackle.The Cherrywood features a full cork handle that’s comfortable and warm to the touch.Our only gripe: the stainless guides aren’t as strong as they could be, though you’re unlikely to put them to the test on an ultralight ice rig. Length: 30”Material: graphite/fiberglassPower/action: QT (Quick Tip), essentially ultralight with a slower action than usualHandle: corkGuide material: titaniumFrabill is a serious name in ice fishing, and it built its reputation almost entirely on the winter season. No stranger to the needs of the sport, they offer species- and technique-specific rods for the winter angler. Designed for panfish, the Bro series–named for ice fishing legend Brian “Bro” Brosdahl–is a premium rod that won’t disappoint.This 30-inch rod features four titanium main guides that pamper your line when the fight is on. Unlike many of its competitors, this mixed-material rod is stiff where it counts and sensitive at the tip, making the most of this marriage of glass and graphite. Perhaps a bit stiffer overall than similar alternatives, Frabill’s Bro series rods have more backbone than you might expect, allowing you to muscle fat panfish and small pike to the hole.Relatively short in the cork handle, this rod features a strong graphite reel seat. Length: 27”Material: graphitePower/action: ultralight/fastHandle: corkGuide material: proprietary “Evolve” seriesIf you’ve spent any time on the ice, you’re familiar with 13 Fishing’s famous range of in-line reels. They offer excellent rods, too, and the White Noise Ultra Light is every bit on par with their other tackle offerings.A sensitive, strong, graphite blank forms the heart of this rod. That’s a good start in our book, but to get the most feel from this rod, be sure to use braided line.It features a long, comfortable cork handle and three main guides in 13 Fishing’s proprietary “Evolve” pattern. We’re not sure what the material is, but we’re sure about its performance: smooth, cool, and frictionless.The 27-inch White Noise is sensitive enough for the lightest strikes and sufficiently strong to stand up to a real fight. Indeed, we wouldn’t feel under-gunned for larger fish with the right line, and if you happen to hook a walleye or pike, you can be confident it’ll do it’s part if you play to this rod’s strengths. Length: 26”Material: fiberglassPower/action: light/fastHandle: EVA foamGuide material: stainless steelShakespeare’s Ugly Stik has been around for a long while, earning a well-deserved reputation for toughness through its various iterations. Not everyone’s a fan, however, and these rods are not usually associated with finesse as much as iron-cast durability.This 26-inch rod might change your mind if you’d usually shy away from the brand. Sensitive enough for you to detect the lightest of strikes, if you do hook a monster, your line will give in long before this rod will! In fact, if you’re not sure what you might get nibbling on your lure, spool some 6 pound test and put your tackle to the test. We appreciate that versatility, and while not the most refined of the rods we tested, we’re pretty sure it’s the strongest.The Ugly Stik has four primary guides made from stainless steel–Shakespeare’s single unit Ugly Tuff configuration. It also offers a soft, durable EVA foam handle. While we can’t recommend the reel you’ll often find in a combo, this rod is more than a match for the baddest fish you want to catch. Length: 23”Material: fiberglassPower/action: ultralight/moderateHandle: corkGuide material: stainless steelShakespeare knows fiberglass blanks–no question–and their Wild series is a step-up in refinement from the Ugly Stik that made them famous. 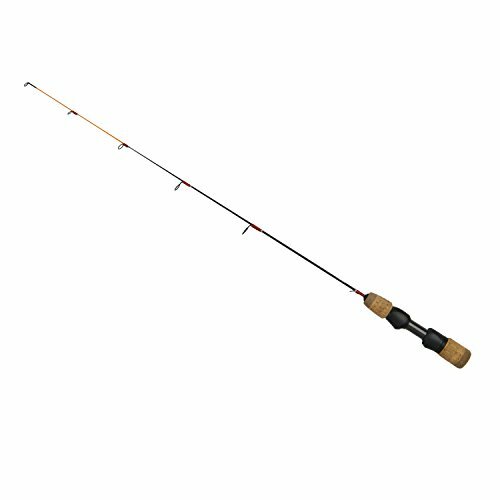 In fact, we feel that the 23-inch Wild ice rod is as nice as many of its premium competitors.This fiberglass rod is sensitive and stiff, offering a great combination of feel and rigidity. As refined as top-end alternatives, we like the backbone this rod offers near the handle. Four primary stainless steel guides lead the tip, reducing the force of the line on any of them by as much as 25 percent when compared to similar rods with one less guide. 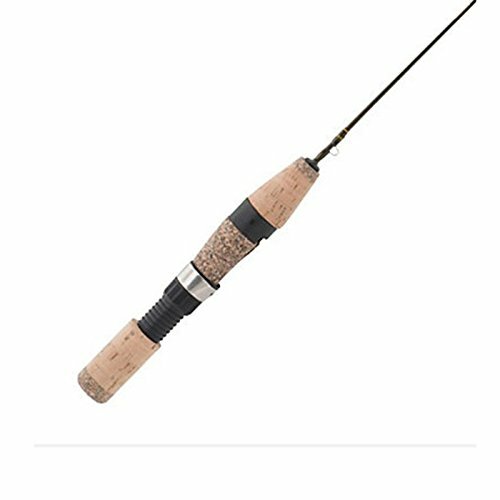 That’s a feature we like a lot, and this rod is definitely worth a second look.A long cork handle rounds off this package, and while not as innovative as the St. Croix, it should provide all-day comfort at roughly one-third of the price. Length: 25”Material: graphitePower/action: ultralight/extra-fastHandle: corkGuide material: stainless steelFenwick supplies premium quality rods for ice anglers, and has built a reputation for quality with a great range of specialty rods. In fact, if you’ve been out on the ice, there’s a good chance you’ll have heard their name and met people who swear by their products. As our reviews revealed, the Aetos is one reason they’re on the lips of so many anglers.Built around a graphite blank, the 25-inch Aetos is incredibly sensitive. You shouldn’t have any trouble detecting nibbles and turning these into quick hook sets. This rod is ultra-fast, so expect a lot of curve when the fight is on. But don’t worry about strength: plenty of really big fish have been landed on these whip-thin rods.The Aetos has a comfortable cork handle and two stainless steel guides prior to the tip. If we have any complaint, it’s that an extra guide or two would be nice. Length: 25”Material: graphitePower/action: ultralight/fastHandle: corkGuide material: stainless with zirconium insertsFenwick’s Elite Tech is a higher-end rod than its Aetos, though whether that translates into better performance is an open question.Its graphite blank is plenty sensitive and strong, among the best of the competition. With the 25-inch Elite Tech in hand, you’ll notice the lightest of bumps, even when fishing deep. That’s nice, and it gets nicer: for an ultralight rod with fast action, there’s plenty of strength in reserve for big fish and hard fights. We’ve no complaints there, to be sure.Its cork handle is generous and comfortable, too, and has a quality feel. Our only issue is with the premium guides. Zirconium inserts are probably overkill for ice fishing, and they’re a feature we’d expect on the casting and spinning rods of summer. They seem a trifle small, too, and we can’t help but wonder about how quickly they’ll clog with ice. That said, this rod is no disappointment in the hand. 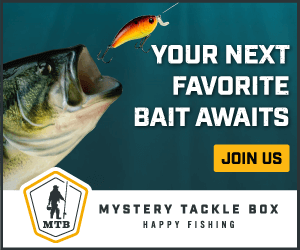 Our Pick – the St. Croix Mojo! This was a tough pick, as there were many excellent rods that made our final cut. In fact, we wouldn’t feel ill-prepared with any of the finalists–and depending on exactly what we were planning for our ultralight adventures, we might make another choice.Our general favorite was the Mojo. St. Croix, because it displays excellent quality from one end to the other. Made from carbon fiber, it’s light, strong, stiff, and sensitive. It features nice guides and an impressive handle, making it pretty much the top of the heap in terms of what it offers. It is a bit pricier than most of the others, but we really feel that you get what you pay for with this rod.That said, the Shakespeare Wild Series is a tough competitor at a much lower price point, and if that matters to you, give one of those a try. Tough, sensitive, and comfortable, it provides a premium feel for a bargain budget. We were also really impressed with 13 Fishing’s White Noise, and as long as you’re using mono, you probably can’t go wrong with that rod, either.Whatever your choice, all of these short rods are long on performance. Ice rods are specialized gear, but since they look like cut-down versions of normal rods, it’s easy to get confused about what makes them tick in comparison to their longer cousins. Let’s discuss some key differences. For the spinning and baitcasting rods of summer, length matters. Whether you’re talking about their ability to take the shock of a big fish, enable a sharp hook set, or facilitate a spectacular cast, every inch counts. Usually ranging from six to eight feet, these rods are long for a reason.But when you’re dropping jigs or live bait through a hole in the ice, the long spring action that makes these rods ideal just gets in the way. Crouched over that tiny patch of water, breath steaming in the air of your hut, you don’t have enough space for a seven-foot casting rod.Ice rods tend to be short: roughly 24 inches on the short end to maybe 36 at the maximum. “Longer” ice rods are generally medium action, allowing you to fight big pike and walleye; while shorter rods are usually light to ultralight, making them the weapon of choice for perch, bluegill, crappie, and trout.Generally, medium-light and medium ice rods will be a bit longer than their ultralight and light siblings designed for the hard water. Those extra inches aren’t there to help you cast, but rather to enhance the spring action of the rod blank to help you fight larger fish. Rods come in a bewildering variety of powers and actions, and these adjectivestogether describe how they behave under the strain of a fish. The stronger the power, the more weight a rod requires to bend. By contrast, a rod’s action tells you where that weight will start to create a bend, with slower action rods curving closer to the reel.Again, ice fishing’s pretty specialized. The frigid water slows the fish down, making them less active and vigorous. In practice, that means that fish won’t strike as aggressively, meaning that you’ll need a very sensitive rod tip to detect those nibbling strikes.Medium-light and medium rods will have stiff backbones, allowing you to muscle larger fish. You’ll want to keep the action fast or extra fast, however, since walleye and monster panfish won’t be ripping your lures off the line. In other words, sensitivity is still critical. Fishing rods are generally composed of one of three materials: graphite, fiberglass, or carbon fiber. This is true for ice rods just as it is for their warm-weather alternatives. You need to know the difference and match them to your lures. Carbon fiber is stiffer, lighter, and stronger than the alternatives, providing fantastic backbone and ultrasensitivity–but expect to pay a premium for this wonder material. When you’re jigging all day, fatigue is an issue. While that may sound like a ridiculous joke, it’s really uncomfortable, and a handle that fits your hand can prevent cramping and allow you to stay on the ice longer.The handles on medium-light and medium rods may be as small as those you’ll find on ultralights, but in many cases, they’ll start to get a bit longer to accommodate two hands. This will help you fight the larger fish these rods are designed for. The guides on these rods should be high-quality and strong. If you can deform the guide with just a bit of pressure, they’re not up to the task. Their number and smoothness are important as well, as a big walleye or small pike can put enormous strain on your line. More–and better quality–guides will help save your line when the fight is on. Length: 36”Material: compositePower/action: medium/fastHandle: corkGuide material: N/AHaat rods are designed and engineered by Eric Haataja, a famous ice fishing guide and record holder. 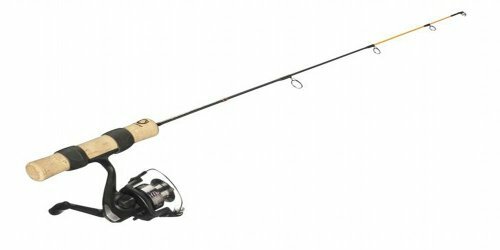 Dissatisfied with commercially available options, he set out to offer anglers the ideal tool to make memories on hard water.Haat’s Medium Spinning Rod features a composite blank, tuned to provide the sensitivity to detect a nibble, and the backbone to ensure hookset and plenty of muscle to land that fish. Quality is awesome–but expect to pay the price for this ultra-premium product.The Medium offers a long, comfortable cork handle that’s ideal for fighting large fish. Of the rods we reviewed, this is hands-down the best in this department, giving you plenty of space to apply muscle.We’re not sure what the guides are composed of, but stainless steel is a good bet. Whatever the material, they’re as smooth and strong as you could hope for.The only drawback of this excellent rod is its high price. Length: 30”Material: carbonPower/action: medium/fastHandle: corkGuide material: stainless steelFrabill knows ice fishing, and for the angler who’s looking to target big walleye and small pike, they have just the rod.Frabill’s Fin-S Pro is built around a carbon fiber blank, offering fantastic strength and sensitivity. Its medium power gives you plenty of backbone to muscle a fish, while its flexible tip will help you feel even the gentlest nudge to your lure. We’re impressed by that combination, especially at this price point.The Fin-S pro features a cork handle that provides enough space for two hands. 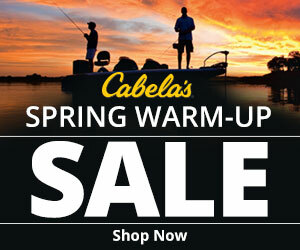 You’ll need that, because large walleye can run up to 20 pounds! Even a bit more handle might be welcome if you tie into a monster, though, but unless a big pike takes your bait, we think this handle will allow for more than enough muscle on your end.This rod offers four primary guides manufactured from stainless steel. Given its 30-inch length and the guides’ excellent spacing, that sounds about right to protect your line from excess strain. Length: 29”Material: carbonPower/action: medium/fastHandle: corkGuide material: stainless steel with zirconium insertsAbu Garcia is an enormously respected brand in the rod and reel business, and if you like baitcasting, you’ll know their name. That doesn’t mean they’ve neglected ice fishing, however, and their Venerate ice rods are worth a close look.A carbon fiber blank gives the Venerate medium a solid backbone while leaving the tip sufficiently sensitive for light strikes. While not the most sensitive tip around, it should be fine for all but the smallest panfish. Large walleyes, trout, and small pike will be easy to notice as they mouth your lures.The Venerate sports a long cork handle, just the medicine you need when a big fish is on your line. We really like this feature, and the rounded tip of this handle will quickly find a place against your stomach as this rod bends under strain. That’s an important point, and something to consider carefully as you weigh your options.Quige quality is excellent, too, and the four primaries are well-spaced and constructed from premium materials. Those zirconium inserts, probably overkill on an ultralight, will really come into their own on a medium rod–smoothing friction, dissipating heat, and coddling your line when it’s being put to the test. Length: 27”Material: graphitePower/action: medium-light/fastHandle: corkGuide material: stainless steel with zirconium insertsFenwick’s Elite Tech is available in a range of power options, and the ultralight made our list in that section as well. As you step up in power, Fenwick, steps up its game, too.Much like its lighter version, this rod features a graphite blank that’s both sensitive and strong; and serious panfish anglers who are hunting for trophies might want to take a look at this rod. With the 27-inch Elite Tech in hand, you won’t miss strikes even when jigging at depth. And its backbone, especially for such a light rod, is impressive.The Elite Tech sports a nicely-shaped cork handle that’s big enough for the fish it’s intended for. If you hook a big walleye, grip space may be a bit tight, but the rod will take it, no question! With four primary guides built from quality components, line stress won’t be an issue. This is where we appreciate zirconium inserts–really overkill on ultralight ice rods–as they’ll help keep your line intact when you tie into a big one.Our only gripe is with the small guides, as they’re prone to ice build-up. As you step up to medium rods, you’re looking for more backbone, longer handles, and stronger, smoother guides than on an ultralight. After all, you’re asking your rod to take the strain of some big, aggressive fish–and you need to make sure it has the features to help you land them.That’s why we chose the Haat Medium Spinning rod. Yes, it’s expensive, and if you’re on a tight budget, take a close look at the Abu Garcia Venerate, which is also an excellent rod. But ounce for ounce, dollar for dollar, you get what you pay for from Haat.This rod screams “fight’s on!” And it has the handle, backbone, sensitivity, and guides to do the hard work to land real monsters. Haat’s been there and done that, and he knows rods like no one else. Give it a try. You won’t regret it. For the spinning and baitcasting rods of summer, length matters. Whether you’re talking about their ability to take the shock of a big fish, enable a sharp hook set, or facilitate a spectacular cast, every inch counts. Usually ranging from six to eight feet, these rods are long for a reason. But when you’re dropping jigs or live bait through a hole in the ice, the long spring action that makes these rods ideal just gets in the way. Crouched over that tiny patch of water, breath steaming in the air of your hut, you don’t have enough space for a seven-foot casting rod. Ice rods tend to be short: roughly 24 inches on the short end to maybe 36 at the maximum. ‘Longer’ ice rods are generally medium action, allowing you to fight big pike and walleye; while shorter rods are usually light to ultralight, making them the weapon of choice for perch, bluegill, crappie, and trout. Medium and medium-heavy rods will typically be a bit longer still than medium-light alternatives. Again, those extra inches aren’t there to help you cast, but rather to enhance the spring action of the rod blank to help you fight larger fish. When you tie into a large pike or lake trout, you’ll need all the spring you can get from a rod! together describe how they behave under the strain of a fish. The stronger the power, the more weight a rod requires to bend. By contrast, a rod’s action tells you where that weight will start to create a bend, with slower action rods curving closer to the reel. Again, ice fishing’s pretty specialized. The frigid water slows the fish down, making them less active and vigorous. In practice, that means that fish won’t strike as aggressively, meaning that you’ll need a very sensitive rod tip to detect those nibbling strikes. Medium and medium-heavy rods are approaching cue stick territory, and they’ll help you control the fight and apply all the muscle you can to land the big boys. As with all ice fishing, though, you’ll want to keep the action fast or extra fast, since strikes will be lighter in frigid water. Unlike rods designed for casting, these cold-weather specialists have short handles. But don’t let that fool you: handle comfort is critical for ice fishing. When you’re jigging all day, fatigue is an issue. While that may sound like a ridiculous joke, it’s really uncomfortable, and a handle that fits your hand can prevent cramping and allow you to stay on the ice longer. The handles on these stiff rods will be large enough for two hands and real leverage. The rings lining the underside of your rod are called guides because they “guide” the line off the spool. Made from a variety of materials, including ceramics like silicon carbide, and metals such as aluminum oxide and stainless steel, guide quality is important. For casting rods, your distance will be affected by the friction the guides create, among other factors. That’s obviously not a problem over the ice. But when the fight is on, guide quality matters. As the fish fights, you’re placing a lot of strain on the line as it rubs the inside of those guides. And low-quality means intense heat, frayed line, and a big one that got away! The guides on these rods should be of the highest quality and greatest strength. Anything less will fail on big fish, fraying your line at the worst moment. Their number and smoothness are critical as well, as the pressure of the line on each of them will be monstrous. JawJacker’s Ice rod is budget-friendly, but don’t let that fool you. It’s top quality. At 31 inches, this graphite-blanked rod has the power you need to fight even the largest fish while retaining sensitivity at the tip. That’s impressive, but not the end of its virtues. The JawJacker’s cork handle is long and built for muscle, an important point when you tie into a bad-boy pike. But perhaps our favorite features are the five–that’s right-five–primary guides made from high-grade ceramic. You don’t get smoother or stronger than that at any price. And with that many points to distribute line stress, we’d be confident when fighting pretty much anything, assuming the line was heavy enough. Celsius’s Black Ice offers ice anglers a rod that can take a real beating. Built around a strong fiberglass blank, you can be confident that your rod snapping is the last thing to worry about. At 30 inches, this rod has plenty of spring to absorb shock and fight a big pike, muskie, or lake trout. We’d like a bit more cork handle for these monsters, but the Celsius should provide enough room for two hands, though space will be tight. It features three main guides made from chrome–a nice, smooth material that’ll pamper your line when it’s being strained near the point of breaking. We’d like to see more guides to help distribute that strain, because there probably aren’t enough. A high visibility tip helps you see bites, and we think the action is more than quick enough for the prey you’re looking to hook. 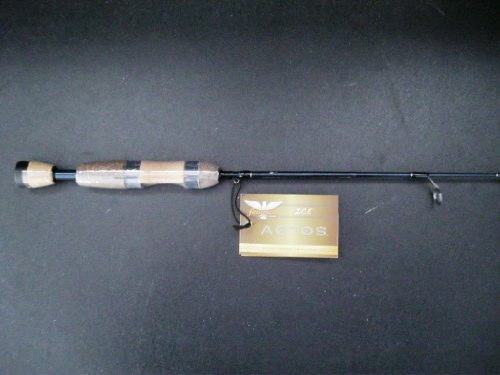 A Haat rod was our top pick in the medium power category because its features are simply top-flight. This is just as true as you take the next step up in power, too. For our money, Haat rods are pretty much unbeatable. The heart of this 45-inch rod is a composite blank that’s supple and sensitive at the tip while remaining incredibly strong along its length. There’s simply no question about the strength of this rod or its backbone–it’s even been used in salt to take sharks. That says a lot, because sharks put up an incredible fight. It also features a long cork handle built for leverage. When you’ve got 100 pounds on the line, you’ll need every inch of that cork, and you’ll bury the heel into your gut to get even more power. The Haat’s handle is just as good as it gets. Offering six primary guides, prevention of line stress was an obvious goal, taking the worry out of your fishing adventure. It simply doesn’t get better than this. 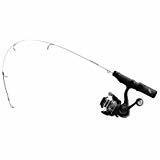 This rod is designed to accept a baitcasting reel, the strongest set-up available for large fish. If you don’t have one, or aren’t familiar with them, that can be a real drawback. Our Pick – the JawJacker Ice Rod! This was a tough choice for us, but the JawJacker just edges the awesome Haat out of first place. Strong, supple, well-handled, and built for a fight, the JawJacker Ice Rod is good enough to make your fellow anglers envious. Its blank is impressively powerful and sensitive, more than strong enough for the biggest fish you’ll tie into. And the guide quality and handle design will help you land those big ones. That’s a lot to like, to be sure. And while the Haat is the better overall rod, it is more expensive. Adding to that, you’ll need a strong baitcasting reel. If you already have one, by all means, grab a Haat! But if you don’t, or if you’re not familiar with baitcasters, we’d stick with the otherwise excellent JawJacker.